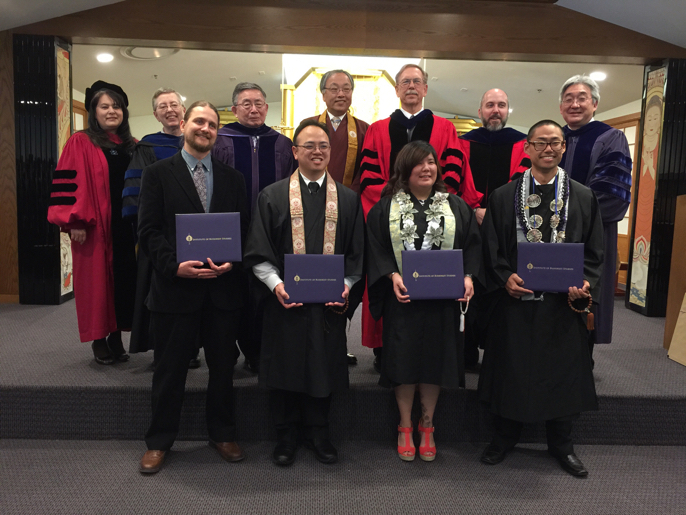 IBS graduates go on to careers in Buddhist ministry and chaplaincy, working in temples, meditation centers, hospitals, the armed services, and more. Other graduates continue their academic work and pursue a doctorate at the Graduate Theological Union or elsewhere. For more than forty years IBS students have been producing excellent scholarship on a range of Buddhist studies topics from doctrinal studies to historical studies, from ethnographic accounts to translations of key texts. Explore our graduates’ work here. The Institute of Buddhist Studies is always interested to hear what you’ve been up to since graduation. Please let us know your news, including publications, performances, weddings, births and gatherings. Also please feel free to get in touch with us anytime to update your contact information. The purpose of the Alumni Association of the Institute of Buddhist Studies is to uphold the mission, vision and values of the Institute of Buddhist Studies as outlined in the Strategic Plan, to aid the President, Board of Trustees, Faculty and Staff in the advancement of the Institute of Buddhist Studies, to foster a spirit of sangha among its members for their continued well-being and welfare, and to nurture the work of compassionate service and engagement in the community.